Home » Blog » 8 Questions That Will Determine if Entrepreneurship is For You? 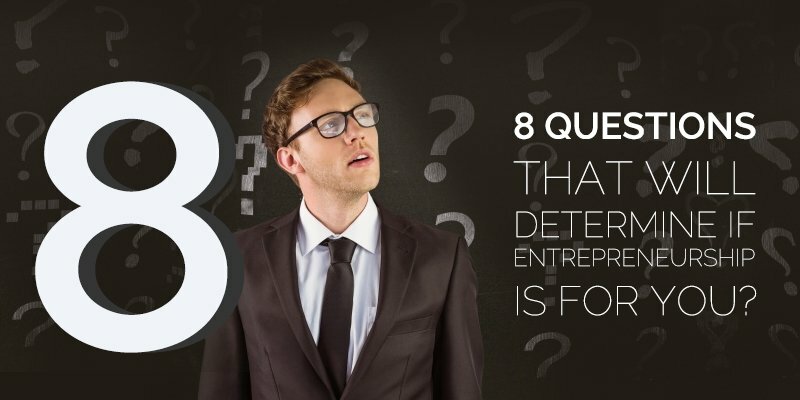 8 Questions That Will Determine if Entrepreneurship is For You? You want to start your own business because you are tired of being an employee. It is time for you to be the captain of your own ship and steer your way towards prosperity. You see entrepreneurship as the only viable option that will put you in the position to achieve this goal. While this may be true, you want to be sure that entrepreneurship is for you before quitting your job to become an entrepreneur. Many people think about entrepreneurship and only see the results of a successful entrepreneur who worked hard for years to build a successful business. They do not see the struggle, setbacks, and failures that entrepreneur had to endure on their journey towards success. Therefore, a fantasy of entrepreneurship is in their mind, instead of the actual entrepreneurial process. Entrepreneurship can be grueling, and it takes personal sacrifice to build a business. You will also need to be willing to step outside of your comfort zone in order to position your business for growth. Your life will revolve around your business because so much is on the line for it to succeed. Are you ready for this type of pressure? If you believe so, then you will need to learn about the many other factors that go into being an entrepreneur. Understanding these factors and how you would grade yourself for each, will help you better score your ability to succeed as an entrepreneur. Risks is something that cannot be avoided as an entrepreneur. You are working to take an idea and transform it into an operating business. This means you will have to invest time and money into this endeavor, with no guarantee that it will be successful. If you need the certainty and protection of a job that pays you on a set schedule, then entrepreneurship is not for you. You must be comfortable with being uncomfortable. No day is the same as an entrepreneur. One day can be good and the remainder of your week can be bad. You must possess the ability to move forward despite not knowing how things will turn out. Entrepreneurship will require you to have the ultimate belief in yourself and your ability to succeed, no matter if the challenges you are facing are very difficult to overcome. As an entrepreneur, you are in this fight alone. Your family and friends do not understand the lifestyle that you live, so they will not offer much in terms of support. You will have to be able to remain strong mentally, despite feeling as if you are alone. It is also important that you understand that there is no one looking over your shoulder to ensure that your work is being done. You will need to be accountable for your actions and be a self starter. Discipline and focus will need to be the two characteristics that you work on developing if you want to be successful as an entrepreneur. They will help you remain productive so that you are consistently working towards growing your business. Do You Possess Great Persuasion Skills? You will need to have great communication skills in order to succeed as an entrepreneur. Along with skills to persuade people to purchase your products or services. Also you need an abality to make people work for your business. This can also be called the art of selling. It is important that you are comfortable with public speaking. It is the best way to persuade a large group of people in one room. This will help you achieve your goals much quicker. You will need to be a very personable person, possessing the ability to engage people effectively. You will need to meet people daily who can help support your business in some way, from being a customer to creating a strategic alliance. The success of developing such relationships will be based on your persuasion skills. Negotiation is something that you will have to do on a daily basis as an entrepreneur. You will have to negotiate with your vendors, landlord, service providers, and even customers when selling high ticket items.Being able to negotiate will save you a lot of money in the long run. You will need to practice your negotiation skills daily. Try to negotiate as much as possible when the occasion arises so that it can become second nature to you. After a while, you will be able to know how to specifically speak to certain people in order for them to do things in your favor. As an entrepreneur, you will need to be able to think on your feet rather quickly. You will need to be resourceful and able to find new options when your first option is no longer viable. This means you will need to possess a mind that is able to adapt to any situation that you are facing at the moment. Possessing a creative mind will help you accomplish more, as you are able to see things that your competition does not. This is how Apple was able to build products that gained a cult following among consumers. Steve Jobs thought ahead to create a product (iPhone) the consumer did not even know they needed. But once it was introduced, they have come to not be able to function without the product. When you are an entrepreneur, you cannot allow your current position to affect how you operate in the moment. Just because you are not earning 6 or 7 figures at the moment does not mean that you should not possess the mindset or work ethic of a millionaire entrepreneur. If you do not put in the hard work consistently you will find it very hard to succeed. Set your desired vision and work towards it every day. Outline the goals and initiatives that will help you produce your vision. Everything you do in the short-term should work towards your long-term plans. This will help you stay focused and move your entrepreneurial journey forward despite any challenges that you are dealing with. Many of the most successful entrepreneurs achieved their greatness despite what they were going through. This is because their long-term vision was worth fighting for each and every day. As you are starting out as an entrepreneur, you will not have everything available to you that you would like.Your cash may be low, your office may be your kitchen, and you may not have employees to help you get work done. None of this matters. You still must find a way to make your business successful. Therefore, you will need to know how to turn $20 into $500. You must know how to get things done despite what you do not have. This means you must find creative ways to accomplish your goals. Most entrepreneurs who are in this position strive to outwork their competition. They also try to form strategic alliances that provide them with the resources that they do not have.You will need to know how to think quickly so that you can move forward without any hesitation. Hesitant thoughts will only slow down your progress. Knowing that support will be minimal from your family and friends, you will need to find other sources for support. It is best to seek out the support of other entrepreneurs or a mentor. These are people who understand your entrepreneurial journey, so they can help you navigate through the different phases of your journey. Join different entrepreneur groups and associations. Go to networking events and develop these crucial relationships. When you are confused or need advice about anything you are going through with your business, you will have experienced people that you can reach out to. As you can see, entrepreneurship is a process that involves many different elements which work together to develop you into a successful entrepreneur. Entrepreneurship is not like a job where you can just turn it on and off. You will need to constantly remain on so that you do not lose your momentum. A loss of focus or a feeling of doubt can completely derail your progress, which is very hard for you to regain sometimes. You may be thinking that entrepreneurship sounds like a huge challenge Well that is quite true. If anybody could succeed at it, then everybody would be building successful businesses. But not just anybody can be an entrepreneur, which is why so many businesses fail every year. People just jumped into being an entrepreneur without taking the time to truly understand entrepreneurship. It is best to thoroughly educate yourself before coming into the entrepreneur lifestyle. The factors that go into entrepreneurship have been provided for you. Do you think you have what it takes to be an entrepreneur? Analyze yourself critically before making your final decision. You need to be honest with yourself so that you do not take on something you are not prepared to handle. Looking For Business Support To Manage Your Business Better? AsiaBiz offers a suite of business and advisory solutions to help you run your Singapore company operations as seamlessly as possible, and at affordable rates. Business Financing Questions You Need to Answer 10 Questions To Need to Answer Before Starting Your Own Business: Part One 10 Questions To Need to Answer Before Starting Your Own Business: Part Two How do I determine my financial year end?